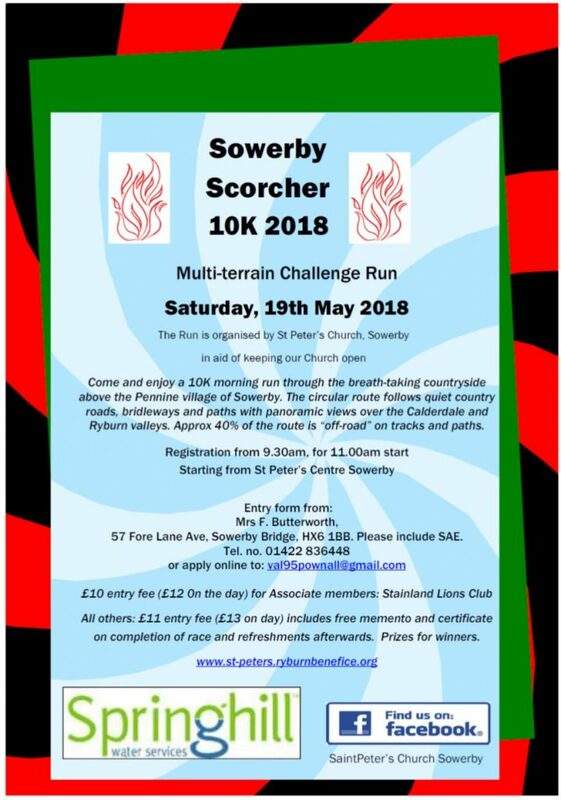 The Sowerby Scorcher 10k challenge run was first held in 2009, making 2018’s race the 10th anniversary event, and is firmly established as a major fixture in our church calendar. It continues to attract runners from within our community and further afield and makes a significant contribution to our fundraising needs each year. We thank Springhill Water Services for their ongoing sponsorship which helps cover the administrative costs of the event. Click here to see some photos from last year’s event. 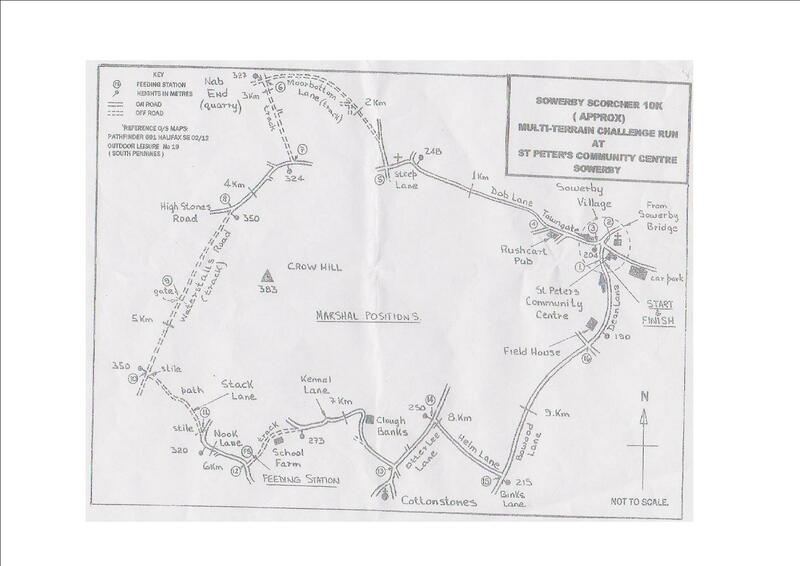 Below is a basic map of the route, starting and finishing at St Peter’s Community Centre opposite the church, which shows the frequent marshalling points around the course and the water station approx. half way round. Many thanks to the team of volunteers who give up their morning on race day to support the runners around the course. All runners must register on arrival at the Centre on race day, registration open at 9.30am. Completing your entry forms before the day helps the registration team greatly and is much appreciated (as well as cheaper!). Please note entry on the day closes at 10.30am in order for the race to begin promptly at 11.00am. All runners must also de-register at the end of the race in order that all entrants can be accounted for. If you drop out of the race at any point, please either return to the Centre to deregister or inform the nearest marshal ensuring your race number is recorded so that the race co-ordinator can be made aware. Many thanks to the volunteers who make up the entry/registration/time-keeping team. All runners who complete the race receive a certificate and also a memento souvenir as part of their entry fee; this year there is a new medal on offer. As well as a water station part way round the course, there is plenty of cups of water available outside the Centre once through the finishing line. 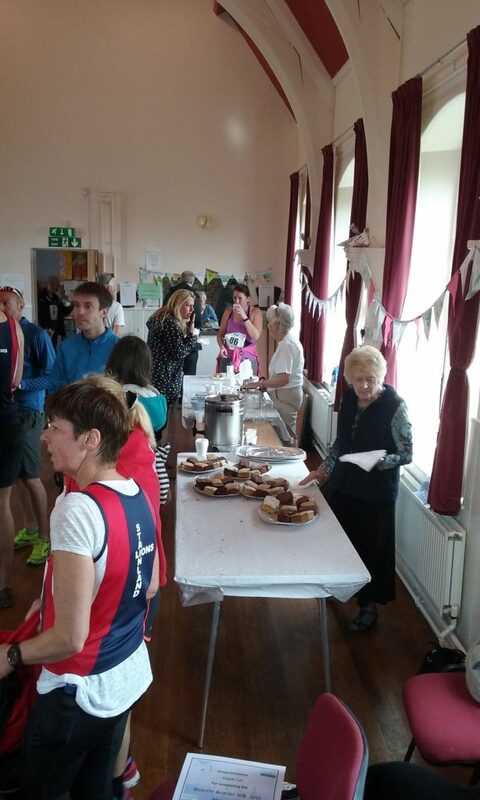 When de-registering, each runner is given a raffle ticket – the only thing this wins you is a free cup of tea/coffee and piece of homemade cake! 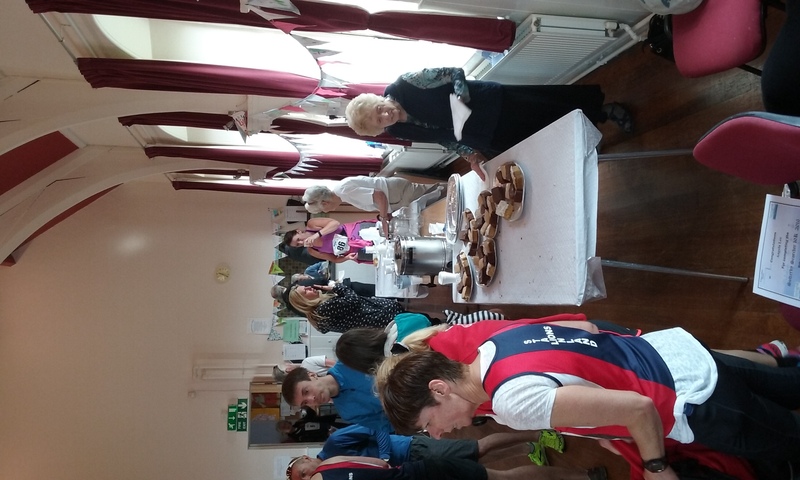 Refreshments are also available at a reasonable price for the family and friends we hope you’ve brought with you to offer encouragement and support. The hard work of our catering team both in preparation and on race day is much appreciated and often gets very positive feedback. Prizes are given to the first, second and third place male, female and veteran runners. The presentation is made at 12.30pm in the hall at the Centre. Please stay and support the winners. We look forward to seeing you on the day and hope you all enjoy the race. Thank you for supporting our fundraising efforts.